Many of you know that we are using smart labels with QR codes and NFC chips to locate users. Since mid-March xamoom also supports GPS geofencing, serving the right content based on the user’s location. With today’s roll-out of xamoom version 3.7 (codenamed “Robert Musil”) we have improved that, made it more practical and prettier. A Geofence is an imaginary radius around defined geo-coordinates. The smartphone’s GPS module does the localization. The usage is identical for all the major mobile operating systems (iOS, Android, Windows Phone). Required is only a modern browser that understands HTML5 and activated location services (GPS) on the device. The user visits the site xm.gl in a mobile browser. Once there, he must grant permission to query the location. The browser sends the location to the xamoom cloud. The right content in the correct language (based on the phone’s settings) is sent back to the user. Are there other locations available within a 40-meter radius around the user, more content cards are listed according to their distance. In the example below, only one content item is available. It shows also a map with the next ten locations, where information is available. All this is done in full respect of the user’s privacy, who we do not know anyway. Logical, but it should be mentioned for the sake of completeness, that this is not or only to some extent possible within buildings. If a customer does not like xm.gl and rather wants to use m.myplace.co.uk, this will be possible in the fall of 2015 to the customers of xamoom. So customers will either use our layout or they can design their own look and feel from scratch. GPS tracking will also be possible in the apps. The software development kit (SDK) for iOS is already available. The one for Android will follow within a few weeks. You can find more details on our developer pages. The blog title is not at all misleading. It’s simply true. You do not have to print smart labels, write NFC chips and roll them out to various locations. Whoever wants to roll out a mobile information system based on GPS geofencing, needs only a few hours instead of months and months of project times – always assuming that the content is already there. 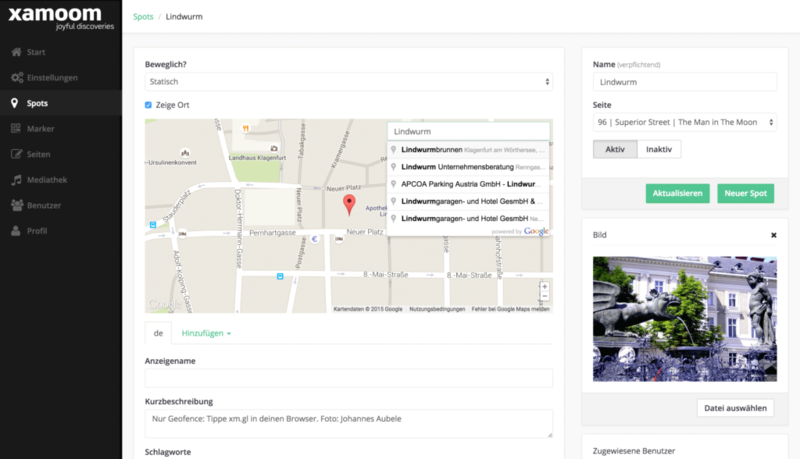 Every spot in xamoom has a map together with an easy Google search (address, POI, coordinates, etc.). Every spot with a map entry is automatically a geofence. 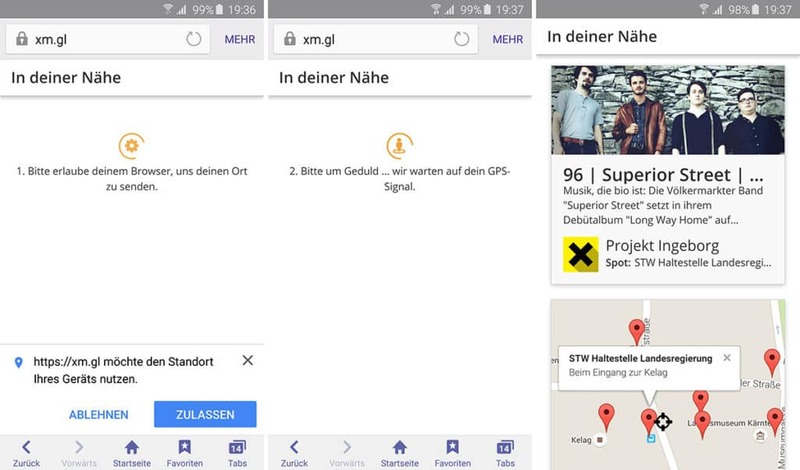 The only thing missing now is a page connected to the spot – and the multilingual mobile information system is in place. If that’s so simple – why is not everyone doing this? Well, xamoom has not been in existence for that long but that’s only part of the truth. No one can see a GPS geofence alone and thus no one knows that there is something to discover at this location. No one who knows, what action (e.g. enter URL in a browser) to take. … they can be designed in a very flashy fashion and thus they are very visible. … with them, you can continue your own branding in the real world. … you can print a little guide on them. … they do not require (unlike iBeacons) no apps, but rather utilize the mobile web. With ever lower installation rates for apps, no barriers should be put up. These are all good reasons for smart labels. GPS geofencing is indeed practical and rolled out very quickly. However, by itself, the technique is of limited use.